Matthias Erb: “This is the platform of the future." TRAVERSE CITY, Michigan -- Volkswagen Group’s idea for the car of tomorrow borrows a lot from yesterday. 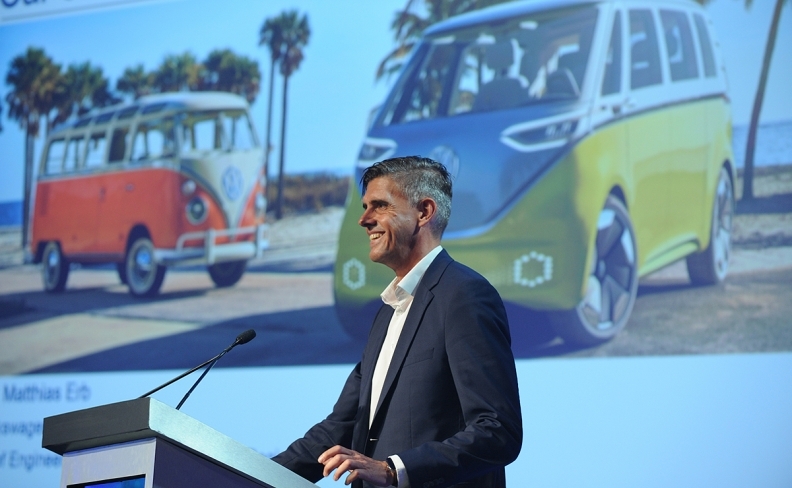 Matthias Erb, Volkswagen's chief engineering officer, explained at the CAR Management Briefing Seminars on Wednesday that the automaker’s I.D. Buzz microbus, an autonomous, electric van that debuted in January at the Detroit auto show, borrows design and functionality elements from the company’s first eight-seater, the T-1 bus known as the Bulli. “It’s the new version with a lot of new features for today,” Erb said, speaking about driverless car design. The I.D. Buzz concept shown in Detroit features a floor-mounted 111-kilowatt-hour battery pack and up to 369 hp with an effective range of up to 270 miles under U.S. standards. It features VW’s I.D. Pilot autonomous driving system, complete with a squared steering wheel that retracts into the instrument panel when the autonomous driving system is engaged. The cockpit also includes a touch-sensitive steering mechanism, an augmented reality head-up display and a large, detachable center-mounted tablet information screen. It also features swivel chairs and the capability to turn the third-row seats into a bed. While the interior looks futuristic, the exterior harkens back to the microbus that VW started selling in 1950. But it does include new-age LEDs that can react to a driver’s presence. Erb said the automaker envisions the I.D. Buzz as an ideal way to haul up to eight people for car-sharing services, or for commercial use. It’s built on the automaker’s new MEB platform, and the concept version featured an electric motor at each axle. “This is the platform of the future,” Erb said. Executives designed the first Bulli because they wanted a vehicle with a similar powertrain and chassis as the original Beetle but with the option to seat eight. By 1956, the bus had a 91 percent market share in its segment, Erb said. It featured three body styles, including a pickup version. VW discontinued Bulli sales in the U.S. in 2003, but it has continued to sell the microbus in Europe, where it is in its sixth generation. “We have to go back in our history to move on and build a bridge between cultures and apply that to our products and design language of the future,” he said.